Grant Morrison has written important and critically acclaimed runs on Animal Man, Doom Patrol, JLA, the X-Men as well as many others. He’s had notable creator-owned works including the Invisibles, WE3 and Zenith. And, even though he’s well-known for his American comics work, his first published work was in the British anthology mag, Near Myths, in 1978. It also featured Bryan Talbot’s Luther Arkwright and work by Brian Lumley. 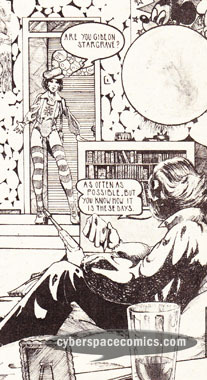 Morrison’s contributions for this anthology include: Time Is A Four Lettered Word, Gideon Stargrave and Checkmate Man. It should be noted that not only is Morrison the writer for these features but, he’s also the artist!